Product prices and availability are accurate as of 2019-04-18 00:50:42 UTC and are subject to change. Any price and availability information displayed on http://www.amazon.com/ at the time of purchase will apply to the purchase of this product. Built with high-quality, strong and durable material yet extremely light-weight. 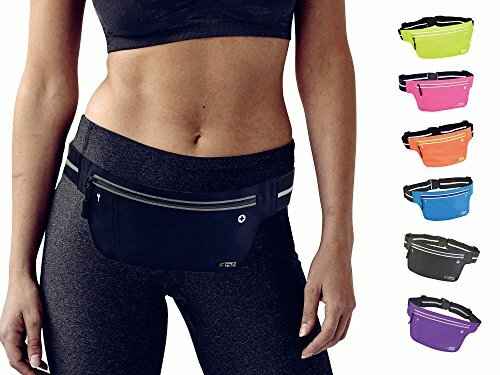 Built with 3 layers of skin-like fabric and water-resistance fabric, reduces chafing, increases comfort, allows for better ventilation, and keeps your valuables dry from sweat and water. Its light-weight design to only provide convenience so you can enjoy running, it can also be used a diverse range of outdoor activities! Furthermore, you can also use this to carry your passport, IDs, backup cash, etc., when you are travelling. Fitter's Niche prioritizes on ensuring excellence in Quality, Eco-friendliness and Utmost Comfort with our Fitness Sport Gear Apparel, Outdoor Accessories & Innovative Health devices. -30-Day MONEY BACK for ANY REASON. Please refer to Amazon's return policy. - For any technical support or inquiry, please also feel free to contact with the above email address. Please keep away from fire, or corrosive liquid. Please keep away from kids under 6 year sold. 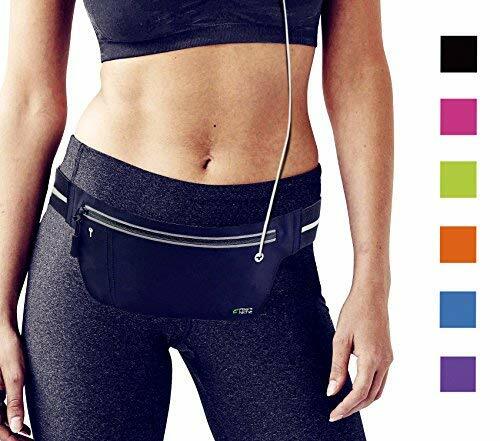 Made with Quality Spandex Lycra and Water and Spill Resistant fabric protecting your devices and personal items from water, moisture, sweat, rain and snow. It is not water proof. 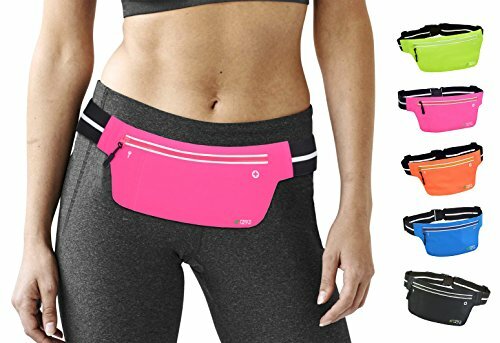 Perfect for trail running, jogging, taking walks, biking, traveling, Zumba, piloxing, spinning, etc. and various workout on machines such as treadmill, elliptical, etc Ultra Light-Weight (0.15lbs/2.5 oz) and Ultra Slim, thus highly reducing bouncing when exercising. 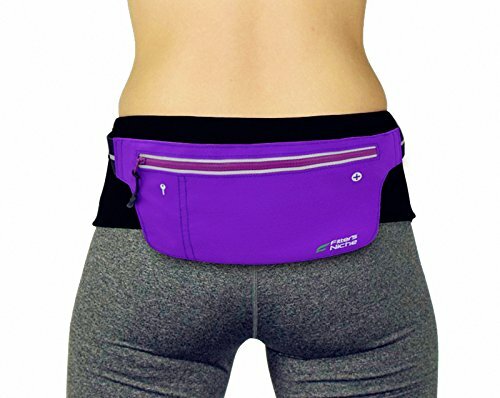 A premium adjustable elastic waistband holds the fanny pack securely and comfortably around your waist, reducing chafing. Perfect for waist sizes from 24-63 inches, please be sure to double check your waist size before purchasing. 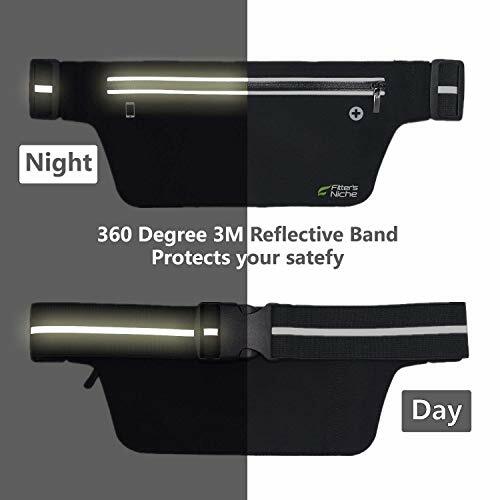 For Safety: a 360 degree 3M Reflective Strip along the waistband increases your visibility when running or conducting various outdoor activities at night, during bad weather, or during low light conditions (eg. Foggy, rainy, snowy, windy, etc). Pouch (zippered) can hold essentials such as Phones, keys, cards, change, passport or inhaler; keeping your hands free and Snug enough to reduce jostling of items. Pouch is large enough to carry a 6 inch phone, such as iPhone X, 8 7 6plus, 5s, Samsung ntoe 8 etc. PLEASE NOTE, heavy duty cases like the OtterBox will be a tight fit, best to take it off. Additional Inner Pocket especially designed to hold and separate your keys to prevent scratching of your phone's screen or other valuables. Contains a headphone cable hole allowing your headphone cables to pass through so you can listen to music while leaving your phone in the pouch.